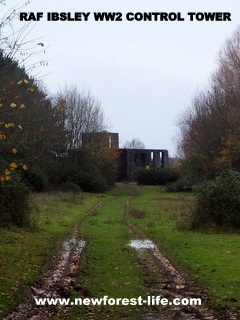 The New Forest RAF Ibsley WW2 airfield is now derelict. A sorry sight to see but there is some good news too.. Recently, we set out in search of the Control Tower for New Forest RAF Ibsley WW2 airfield, to see if anything was left of the runway. What we found was a very sad sight indeed. This is one view of the Control Tower for the New Forest R.A.F. 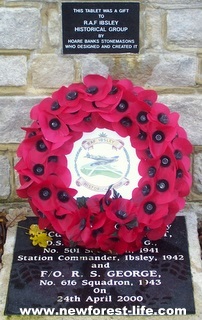 Ibsley WW2 Airfield. Although this New Forest World War Two airfield does still exist, as you can see, it is just a ghostly reminder of its glory days. It stands forlornly looking over gravel lakes which are on the site where the actual WW2 runway was once located. Perhaps you have comments or wartime memories or questions you would like to add? 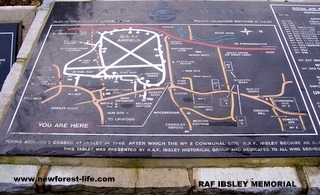 Did you ever serve at the New Forest RAF Ibsley WW2 airfield? Did you have relatives or friends who served here? We'd love to hear your WW2 . Please fill in the form at the bottom of the page - your memories, views and comments can be shared by us all. We've discovered there are 2 views of the derelict Control Tower. The top photo is taken from the road and is as close as you can get. However, we've recently joined the Hampshire and I.O.W. Wildlife Trust and as well as offering the most spectacular habitat to view woodland birds and migrating water fowl, you can also get another view of the WW2 Ibsley Airfield Control Tower, as you can see below. Once the restoration project is complete we will be able to experience the true history of this important WW2 airfield site. New Forest R.A.F. Ibsley Control Tower viewed from The Hampshire and I.O.W. Blashford Lakes. Latest news on the restoration of R.A.F. Ibsley Airfields Control Tower. The land is privately owned by a gravel company who have extracted gravel over the years and left vast areas of deep water lakes. It is on private land and therefore not accessible. However, it appears that there is help at hand. R.A.F. Ibsley Historical Group is making a valiant effort to keep this history alive. If you visit their website you will be able to find out why the group was formed and what its aims are for the future. I always thought the gravel lakes were a wonderful environmental and wildlife contribution to the area. I didn't realise, at the time, what once stood on the site. I'm stunned the history and area where the control tower stands today, was just left to decay and become a sad ruin, but wish the restoration project success for the future. I'll be updating you as the project progresses - time is running out to save this important part of the New Forest National Park and its WW2 history. There seems to be no trace left of the runway and airfield apart from the control tower. Further along the road towards the crossroads at Ibsley, on the opposite corner to the little chapel, there is a lovely memorial erected. As you can see from these pictures it holds the plan of the airfield in relation to the surrounding village. 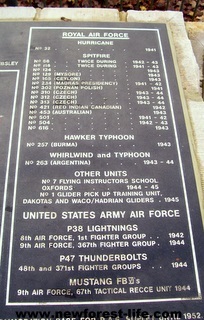 It also has the WW2 RAF memorial names of those who flew out from RAF Ibsley and shows that the crews came from many countries. They flew Spitfires, Hurricanes, Typhoons, Hawker Typhoons, Lightnings, Thunderbolts and Mustang. This memorial is quite a recent addition to the village and is well maintained thanks to the R.A.F.Ibsley Historical Groups hard work. It appears someone cares about keeping the history of this area of the New Forest during World War Two alive in our memories. I know it is not a good idea to return to an area because you are often disappointed but I feel the site of the RAF Ibsley Control Tower in such a sorry state would upset anyone who came to try to retrieve WW2 New Forest history or trace family members who may have flown from here. 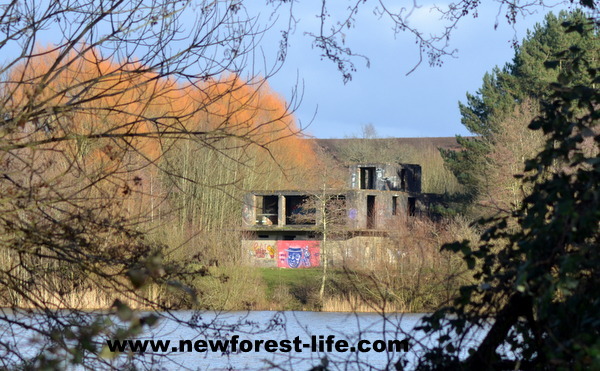 The New Forest RAF Ibsley WW2 airfield - what is happening now? I found it quite sad to think this must once have been a really lively area. You can imagine the buzz there must have been as these brave aircrew prepared to set off on dangerous missions. All in an attempt to win the Second World War. You can find out more about the Control Tower at Ibsley and what work is in progress in the area by following the New Forest R.A.F. Ibsley Historical Group News page. You can see a painting of the Control Tower as it was during active duty during WW2 which was painted in 2001. Update Dec 2009: I've tried contacting this group but had the email returned so at this time not sure how active this group is today!